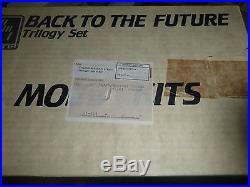 AMT Ertl Back to Future Trilogy Set 1/25 Model Cars Vintage 1991. Older special edition kit from AMT Blueprinter magazine. Comes in white plain cardboard box. /Instructions here for all 3 kits. The first original car, Part II hover wheel type and Part III the railroad wheel car. All parts in factory sealed bags. Everything here ready to build 3 complete cars. Thanks for checking out or items. THANK YOU TO ALL OUR LOYAL CUSTOMERS. YOU MAKE THIS STORE WORK!! PUT IT IN YOUR CART, THEN WHEN YOU ARE DONE LOOK ABOVE THE ITEMS FOR "REQUEST INVOICE", , then do not pay tiL you get a combined invoice thanks, matt. WE SOMETIMES MAKE MISTAKES AND WE FIX THEM! NO BANK WIRES, IOU'S, BANK TRANSFERS. Check out my other items. GENERALLY OVER 1000 MODEL CAR AND TRUCK KITS LISTED! Be sure to add me to your favorites list. The item "AMT ERTL BACK TO THE FUTURE TRILOGY 1/25 Model Car Mountain 3 DELOREAN KITS" is in sale since Friday, June 02, 2017. This item is in the category "Toys & Hobbies\Models & Kits\Automotive\Classic". The seller is "n2flying27" and is located in Churchville, Virginia. This item can be shipped worldwide.